A pair of turquiose ceramic lamps with original striped shades! Greener hue changes to blue towards the top of the lamps, vintage circa 1960s. Total height with shades 40", ceramic bases only 22". 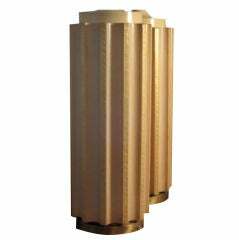 A pair of unusual, scalloped-column shaped lamps, covered in leather with greek key embossed design. Original mica shades included. An interesting ceramic gourd lamp with sgraffito decoration and original shade. Total height with shade is approx. 30". 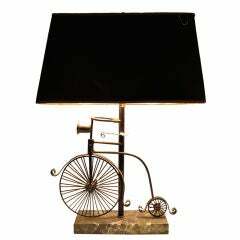 Ceramic only measures 14" H, 10" D.
A charming bicycle lamp on a marble base. Original shade. An unusual white ceramic lamp-biomorphic design with rounded cut outs and original shade. 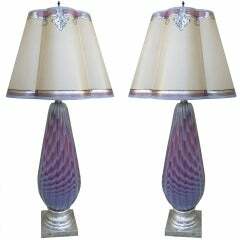 Pair of midcentury ceramic lamps with original shades. Original wiring. Vibrant blue and green glaze in a high gloss finish. 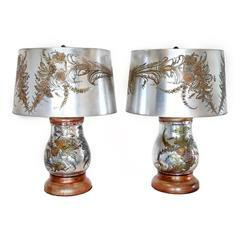 Beautiful pair of Verre églomisé table lamps with original reticulated matching shades. Stunning silver, bronze and gold botanical theme. 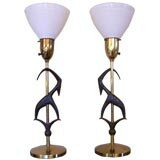 A wonderful pair of antelope lamps by Rembrandt with original restored shades that will make a fun statement to any modern decor.